December 3rd is a very important date in the year for me – albeit a particularly sad one – marking as it does the anniversary of the passing of my beloved Dad, Timothy (or Tim, as he was known), who died seven years ago. His sudden, shocking departure from our family was not entirely unexpected, given the nature of his illness (heart disease), but it let a gaping abyss in us that could never be filled. There are are many things that remind me of my Dad – not least when I look in a mirror – but, crucially, I am constantly aware that my decision to anchor my career on my dual passions of Film and Comics come directly from his enthusiastic fostering of those passions in me when I was young. He was a fan of both, so it was only natural, I think. It was with with him that I saw my first film, Star Wars, in late 1977 at the Odeon in Waltham Cross, North London. He fondly remembered how, at the start of the film, I was absolutely terrified by the noise and clung on to him with tears streaming down my cheeks. However, my fear quickly faded and I was inexorably drawn in to the profoundly-exciting new world and I settled back down it my seat, utterly rapt for two hours. We were regular cinema-goers, and my early years were defined by all manner of Spectacular Cinema. This applied at home, too: he was an eager adopter of VHS and my the living room of my childhood home was littered with stacks of video tapes. Indeed, in the early 80’s when window between a cinematic release and a home video was vast, my Dad was not above indulging the shady world of video piracy, so we could revisit the excitement of those films sooner rather than much letter. Many of my friends recall the illicit thrills of those videos and which cemented his status as “A Very Cool Dad”. It was my Dad who tacitly demonstrated to me that Comics are a generational affair. One of my most vivid memories is of a rainy Saturday afternoon in early April, 1982. I was sitting around in my bedroom, reading Superhero comics and he returned home having popped out to the newsagents to pay the paper bill. He came in to my room with a present for me: it was the first issue of the revamped EAGLE. He said, “I used to read this when I was a lad, and I thought it was the “bee’s knees”. I beamed at him and gratefully took his gift, exchanging Superman for the intergalactic adventures of Dan Dare. Indeed, he returned a little while later with an ever greater gift to reinforce his point: his collection of Eagle annuals from the 1950’s that were given to him by his parents. He supported my love of Comics, even when it became clear that I was never going to outgrow them and leave them behind. On our Saturday trips to Forbidden Planet, back when it was located on Upper Oxford Street, he would often express his great surprise that “there’s guys in here who are nearly my age!!”. We went to the fantastic UKCAC conventions in the late 80’s and early 9o’s where he was by my side, holding my bulging bags of swag, a little bewildered as I met the likes of Archie Goodwin and Denny O’Neill. In the 90’s, when I was at boarding school, he made the trip to FP to pick up a copy of the greatly-hyped meeting of Judge Dredd and Batman, drawn by Simon Bisley to send to me. As I made the manoevures to becoming a Film Journalist, my Dad was my greatest supporter and the source of much confidence. He was self-employed and therefore knew the innate struggles that come with pursuing your own path. He’d tell me that nothing was impossible and I believed him. I still do. He would call me at 9 a.m just before the working day began for a quick catch-up and to hear what I’d been up to. He thrilled at every accomplishment and was exceptionally proud of my writing for EMPIRE, seeing that he’d been buying the magazine for me for the preceding 13 years. He expressed regret that he was not able to help me more as he just not familiar with the Media industry, but his instilling of the importance of self-belief, of tenacity and of maintaining passion was more vital that he could have realised. It would have been impossible to achieve this type of career without such mental and emotional armour. When his own business ultimately became a slow victim of The Recession, he felt considerable sense of failure and I vividly remember telling him that he was not a failure, it was just circumstances and how he dealt with those circumstances was, I resolutely believe, heroic. He focused on looking after his family and doing right by the people he employed, of making necessary sacrifices, of being strong and being an effective family leader. For all that, I think – no, I know – my father was a great man. He’s well-remembered by all who knew him and, for myself, I try every day to reflect his qualities. Grief fades, but there remains a quiet, constant sadness of things that he will never get to see, such as my having my own family. If I can be half the parent he was, then I’ll be doing okay. When my father died, I was six months short of my 30th birthday. 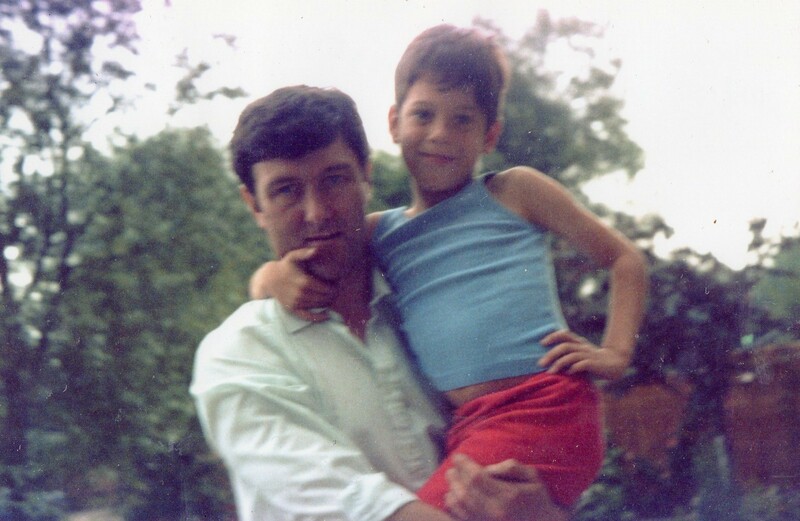 Yet, even as a adult, there was a part of me that felt that I was just a little boy looking for my Dad’s approval, which, of course, he gave me in abundance. That’s why I cherish the photo below, as it sums up my relationship with him really rather perfectly.